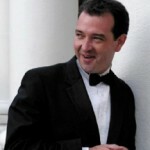 Allison has devoted over 25 years to the health and fitness industry. She is a 500 hour registered yoga teacher with Yoga Alliance and a Certified Johnny G Instructor. Allison has completed several yoga trainings, including many Anusara Immersions, and an Anusara Level 1 & 2 Teacher Trainings. She has trained under some of the country’s premiere yoga experts! Allison is extremely grateful and appreciative of her many teachers for their love, compassion, knowledge and wisdom. By educating herself, she gives a richer experience to her students. Allison is the sole owner of Focus Fitness Main Line and is delighted to have opened her second highly specialized Yoga, Spinning, Pilates and Barre studio; Focus Fitness Brandywine. A favorite spinning instructor on the Main Line for years, Allison is known for consistently packing the studio with devoted riders who are addicted to her energy and zest for the ride, on the bike and in life. Besides her motivational, upbeat style, Allison is also highly regarded for her safe and healthy instruction, making sure students are properly aligned whether on the bike or the mat. In each yoga class, Allison takes her students on a journey. She helps them to experience an awakening of the mind, body, spirit and soul. Allison teaches them to connect these elements, and to use these connections in every day life to feel calmer and more at peace. Her classes are a blend of her intense training and personal soulfulness which results in what some of her students have described as a religious experience. For Allison, teaching is a passion and a privilege. She is honored and humbled to have the opportunity to help people realize their full potential and become the best person they can be. Her FOCUS is truly on her client’s physical and emotional FITNESS. All Carol ever wanted was to work to make enough money to do what she wanted in life. That’s why she started working as a pre-loader and driver for UPS in 1973 just as the Women’s Rights Movement was beginning. She was working two jobs and going for her third job, when she applied to UPS. She wasn’t thinking about women’s rights or equality – just what the job could bring to her. She liked steak and she wasn’t going to work for hamburger prices. Carol was focused on her goals. It was a pattern she has followed her entire life. If she wanted to do something she would find a way to get it done. She liked skiing, horse back riding, flying airplanes (she got her license) sky diving (once), white water rafting, wall climbing, driving Formula 1 cars, stone carving, interior decorating, working in cement and tile and trying new things. She redesigned her home and had it built. Carol does at least one thing she has never done before every year. In 1989 she started a franchise, Sign Stop and in 1991, she left UPS as an operations center manager to join her husband, Dave, full time in their own business. The franchise dissolved and they became Sign Concepts, Inc. (now aka Visual Marketing by Sign Concepts, Inc.) During this time, Carol was a Board Member for Delaware County Chamber of Commerce for one year, Chairman for BDR (Business Development Resources) for 5 years. Carol Mack Warner Visual Marketing by Sign Concepts, Inc. When Lynn Shapira joined her husband in Jacmel, Haiti in March 2010, just weeks after the horrific earthquake, she never imagined she would be returning just a few months later with almost 100 volunteers excited to work in a summer camp that she founded. On her way home, she reflected on the harsh dichotomy; the pristine environment within the airplane versus the misery she left behind. Visions of children playing with wire hangers as kites and traumatized women who lost a child, parent, husband or a home, kept running through her mind. She had to do something. Why not a camp for kids to bring smiles back to them? Why not a grief management program for women to help them cope with their losses? Why not a medical clinic to bring healthcare to these positive, warm people who had rarely seen a doctor? Upon her arrival home, Lynn and her friend, Carole Downs, founded the Haiti Family Initiative (HFI). The first meeting, publicized by word of mouth, drew almost 40 people and every Sunday thereafter, more and more interested volunteers showed up. As the first team arrived in Jacmel in July of 2010, seven other teams and almost 100 volunteers were in the waiting! This summer will be the third HFI Jacmel summer camp, which will be conducted from July to August by 85 volunteers from DE/Philadelphia area. It will include children and women’s programs and a medical clinic. Everyday, more than 100 homeless or orphan children will play games and sports, do arts and crafts and eat their only warm meal of the day. Tax-exempt donations can be sent to: HFI, PO Box 3774, Greenville, DE 19807. For more information, www.HaitiFamilyInitiative.org. Judith Sapol is a Registered Nurse who has always had a keen eye for fashion. When she no longer chose to do nursing she decided to “recycle” herself and use that sense of fashion in a new business venture of “recycled” fashionable clothes. Hence, the beginning of an adventure with “Sophisticated Ladies Consignment Boutique” an upscale consignment boutique that was born in Chadds Ford and is now in a new and larger venue on Route 202 in Glen Mills. This is not a thrift shop! This is a place to buy “upscale fashions at a mere fraction of their retail cost”. Judith originally from Massachusetts, resides in Garnet Valley with her husband Ely. She is a member of the Chadds Ford Business Association. They have 9 grandchildren and are busy traveling and entertaining friends and family. After spending years playing organized sports throughout her youth and college years, Amy decided she wanted to elevate her passion for fitness and health into her career. After receiving her B.A from Hamilton College, Amy completed her M.Ed in Sports Administration from Temple University. She spent time working for a college recreation department, was the Director of Marketing for the Metro Atlantic Athletic Conference, and opened two store locations for lululemon athletica. Throughout those years, she taught Spinning and Pilates at local gyms and at various colleges and universities. After having her daughter in the Fall of 2010, Amy decided to devote more time to her new family while continuing her love for teaching fitness classes! Amy is in certified Spin instructor, an IM=X Pilates Reformer instructor, Power Pilates certified, and has enjoyed teaching Barre classes for Focus Fitness of the Main Line as well as Focus Fitness Brandywine. 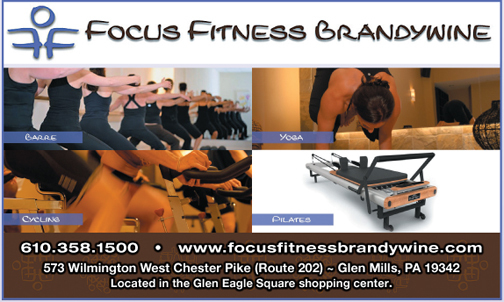 She is now a proud co-owner of Focus Fitness Brandywine and of Barre Focus Fitness™ in Haverford, PA! 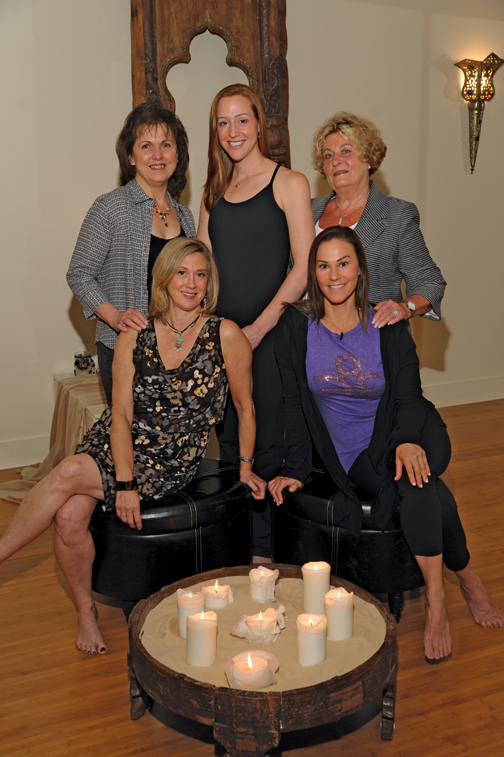 Barre Focus Fitness™ is a Barre studio located in Haverford, PA, the heart of the Main Line. The studio services the areas of Haverford, Havertown, Bryn Mawr, Wayne, Ardmore, Narberth, Wynnewood, and other local towns. Classes offered in the studio are designed to burn fat and sculpt long, lean muscles effectively through a combination of Barre Work, Yoga & Pilates. Our Western DE Cover was shot on location at the lovely Focus Fitness Brandywine located in the Glen Eagle Square Shopping Center, in Glen Mills PA. For information call 1-610-358-1500. Cambio Salon and Spa provided hair and makeup for the shoot, call 1-484-442-8639. As always thank you to these wonderful people for making our job much easier. Mary Rascon is an artist who possesses an eye for color, shape and design with a background in hairdressing and make up. For over 20 years on the main line, she has been dedicated to her clients’ personal enhancement. Proudly, she’s moved her facility to Media and is owner and director of Cambio Salon Spa! The doors of her first facility opened in 1997 in Ardmore, PA. In 2001, the Spa expanded to 5 treatment rooms. Prior to the 1997 opening, Ms. Rascon’s resume includes being recognized as one of the Top 200 Fastest Growing Salons in the United States for 6 consecutive years. Due to her distinguishing qualifications as a teacher and an expert in color and cosmetic applications, she has been named in the National Registry of “Who’s Who”. Mary Rascon and her caring staff believe that their new Media facility and the services that they offer will far exceed your expectations. From advanced, medical grade skin care to the right hair color and cosmetics, we will enhance your appearance and aid you in being your best! ← Previous Story A Lot to Do and Ways to Get There!